Registrations are now open for Year 3 of the Amazing Maasai Ultra marathon, to be held in Laikipia North on 28 September. Runners from across Europe, Asia and the US are set to gather again in the foothills of Mt. 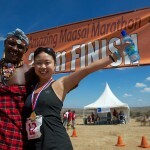 Kenya for this unique running challenge and to experience life in the African bush. 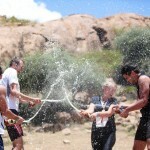 The 6-night race package option includes game drives, walking safaris, traditional Maasai village tours & performances. Weekend packages are also available. “The run takes place in a very remote area, far off the tourist trails”, explain race directors Sarah Edson and Molly Fitzpatrick. Vast African vistas are the backdrop and a very special Maasai community is your host – it is truly a week of cultural, personal, and environmental exploration. 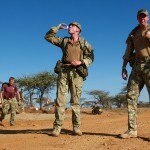 “Last year we had a wide range of participants, including a team from the British Army, a Canadian TV crew, and even a 13-year old running the marathon to raise money for cancer research. 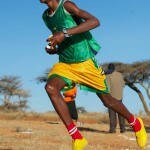 What makes the race so unique though, is the participation of the local runners, who have such natural talent – it’s incredible to witness them all in action.” says Edson. The race in the Laikipia North area is challenging. Runners need to acclimatize to an elevation of 1,800m. The course follows unsealed roads and paths in the bush terrain, with long hills, flat bush lands, and rolling countryside. Edson explains: “Since there is wildlife in the area, the course is patrolled by highly-experienced professional scouts, who track the animals and their movements and ensure the complete safety of our runners.” Besides the 75km ultra marathon and the 42km marathon distance, runners and walkers can also sign-up for a 21km half marathon. 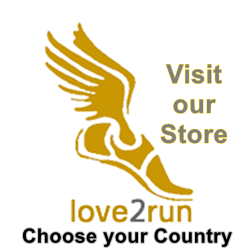 It is possible also to join for the race for just the weekend package. Adventure-seeking runners can make use of the reduced early-bird package prices until 1 May. All proceeds of the event are used to fund scholarships for local Maasai girls through the Amazing Maasai Girls Project, a non-profit US organization founded by the event organizers. “In the past two years, we have been able to raise 60,000 USD and are now financing 4-year high school scholarships for 30 bright girls who would not be able to afford school otherwise. We are aiming to continue our efforts this year, to give more girls a secondary education and empower them to be independent young women with their own voices”, outlines Molly Fitzpatrick. Our runners from China, Europe & the US, ready to run! African adventure – setting out as the sun rises.